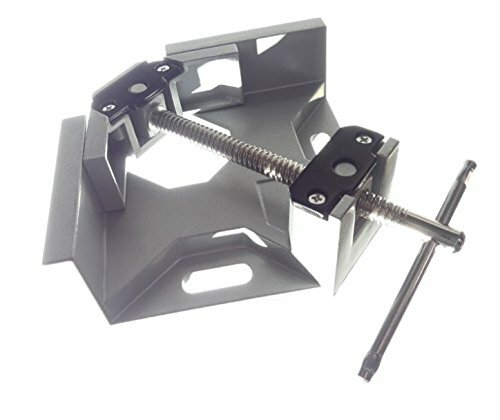 Make precise 90-degree corners for quick and easy joining of wood, plastic, or glass. Holes for secure bench top mounting to keep hands free for tools. Vice holds work pieces steady for fastening with glue, or screws. Cast aluminum body is lightweight and strong. Chrome-plated vice screw prevents rust and corrosion. The sliding T-handle provides maximum torque and ease of operation. Maximum clamp opening is 70mm / 2.75 inches. Manufacturer: TECH TEAM PRODUCTS, INC. Publisher: TECH TEAM PRODUCTS, INC. Studio: TECH TEAM PRODUCTS, INC. If you have any questions about this product by Tech, contact us by completing and submitting the form below. If you are looking for a specif part number, please include it with your message.